Since November, tens of thousands of protesters have taken to the streets of Bangkok to demand less democracy, and there is no end in sight. Thailand is no stranger to political turmoil but the current unrest looks set to be a protracted and especially bitter affair, raising the very real possibility of civil war. The stage seems set for a showdown between anti-government forces, backed by powerful vested interests, and a flawed but democratically elected government that enjoys mass support, especially in its rural heartlands. The conflict is being waged between rival factions of the elite, but also on class, ethnic and regional fronts. Predicting the future in Thai politics is futile, but more mass protests and bloodshed on the streets seem inevitable. Over the past two months, tens – perhaps hundreds – of thousands of protesters have taken to the streets of the capital Bangkok to demand less democracy, and the overthrow of Prime Minister Yingluck Shinawatra’s government. They claim it is illegitimate and controlled by Yingluck’s brother Thaksin, who was overthrown as prime minister in a 2006 military coup. He lives in exile in Dubai to avoid a two-year jail term for abuse of power. The protesters are backed by the ineffectual and misnamed Democrat Party, which has abdicated its role as a responsible opposition and announced that it will boycott snap elections called for Feb. 2. In the knowledge that it is likely to lose once again, it has, in effect, turned its back on democracy. “The opposition has been unable to compete in the game of electoral politics and thus chose to play mob politics and provoke violence to overthrow the government,” said Pavin Chachavalpongpun, associate professor at the University of Kyoto’s Center for Southeast Asian Studies. The protest leaders portray the government “as an evil regime to legitimize their own unreasonable demands and behavior,” he added. The protesters are drawn from Bangkok’s middle class and wealthy elite, and from opposition strongholds in the south of the country. Their constant refrain is that poor rural Thais — those who voted for the government — are ignorant, ill-informed and sell their votes to the highest bidder. Frustrated at the inability of the Democrats to win elections, they say the country is not ready for democracy. This hate-filled rhetoric has contributed to an atmosphere where many Thais are now seriously debating the merits of universal suffrage and one-man-one-vote. Protest leader Suthep Thaugsuban — a former Democrat deputy prime minister facing murder charges for his role in a 2010 crackdown on anti-government demonstrations — now finds himself on the other side of the barricades. He has called for the overthrow of the current government, the suspension of electoral democracy, and rule by an appointed council of “good people” — prompting some commentators to describe his goals as essentially fascist. A rabble-rousing demagogue with a shady background tainted by allegations of corruption, Suthep is hailed as a hero by supporters for his promises to defend the monarchy, tackle graft and clean up government. Although a warrant has been issued for his arrest on an insurrection charge, he rails daily against the “Thaksin regime” from the protest stages. He has vowed to sabotage the election and stop it taking place until legal, political and bureaucratic “reforms” are implemented, though his proposals are vague. Protesters clashed with police as they tried to storm a stadium where election preparations were taking place on Dec. 26, and blocked candidate registration in eight southern provinces. Three people — a policeman and two protesters — were shot dead at the end of December. The gunmen have not been identified, but both sides have hinted at the involvement of a “third hand,” or agents provocateurs. Meanwhile, in the north and northeast of Thailand — the government’s support base — millions of loyal “red shirt” voters are seething with anger over what they see as yet another attempt by the Bangkok elite to bring down a government they have voted into power. The current protests were sparked in November, when the government clumsily tried to push through an amnesty bill that would have pardoned thousands of people convicted of politically related crimes between 2003 and last year. This would have paved the way for the return of Thaksin, a deeply polarizing figure who is loved by his supporters and loathed by his enemies. Human Rights Watch has described Thaksin as “a human rights abuser of the worst kind,” and he has been beset by allegations of corruption and nepotism. Yet he commands fierce loyalty in parts of the country for introducing policies that benefited the rural poor. The policeman-turned-telecoms tycoon, who first swept to power in the 2001 general election, proved an astute politician. He took advantage of broad social changes, appealing to increasingly affluent and better-educated rural voters, especially in the poor northeastern region which had long been neglected by rulers in Bangkok. His government introduced a number of well-received policies, including heavily subsidized healthcare, village grants and micro-credit for small businesses, which opponents decried as “populist” measures designed to buy support. But his brash manner and willingness to upset the status quo made Thaksin many enemies among the Bangkok elite, which revolves around the palace, big business and the senior echelons of the military. They saw him as a threat to the monarchy and their traditional power and privilege. In 2006, following mass street protests similar to the current ones, the army ousted Thaksin in a coup that was welcomed by many in the capital. And yet, despite the best efforts of the elite, the Democrats and a politicized judiciary, the people of Thailand continue to elect Thaksin-backed parties into government. In various guises, they have now won the past five general elections, thanks mainly to their strong support in the north and northeast. The staunchly royalist, nationalist Democrats continue to fare well in Bangkok and the south of the country. But they haven’t won a general election since 1992, although they headed a coalition government from 2008-2011 following a controversial court decision that dissolved a ruling Thaksin-backed party. Now they appear to have given up trying. The unspoken backdrop to all this is the coming royal succession. The current king, who is revered by many as semi-divine, but is 86 years old and ailing. King Bhumibol has reigned since 1946, making him the world’s longest-serving head of state. His designated heir, Crown Prince Vajiralongkorn, faces an uphill task to accrue the “moral authority and sacred power enjoyed by his father,” said Pavin. Most Thais have known nothing other than Bhumibol’s rule, and as the inevitable approaches, parts of society — especially those that have benefited from close links to the palace — are gripped by acute end-of-reign anxiety. This has combined with long-standing fear and prejudice against the “ignorant, uneducated” rural masses to produce the fiery, and often deeply offensive, anti-government rhetoric seen on the protest stages. Marshall lives abroad to avoid charges under Thailand’s strict lese majeste law, which prohibits criticism of royal family members and has had a chilling effect on freedom of speech in the so-called Land of Smiles. Any criticism of the monarchy is taboo, and journalists based in Thailand — including this one — must practice self-censorship to avoid the very real threat of imprisonment. “The lese majeste law prevents Thai journalists from critically taking into account the prominent role of the monarchy institution in Thai society. Our analyses are thus constrained and diminished,” said Pravit Rojanaphruk, one of the few Thai journalists who have dared to speak out on the issue. Both the Democrats and the ruling Pheu Thai party have used the law as a tool to smear opponents, and tens of thousands of websites deemed critical of the monarchy have been blocked. Last month, a Thai man was jailed on several counts including an unprecedented one of “attempting to commit the crime of lese-majeste” after content deemed insulting to the royal family was found on his computer. It is against this background of fear and loathing that the current turmoil on the streets of Bangkok must be seen, as rival factions jockey for power. The ongoing protests in Bangkok highlight the longstanding mistrust between the wealthy capital and the regions — especially the populous northeast, which is known as Isaan and is home to 20 million people. Most of these are ethnic Lao and speak a Lao dialect, though their ties to neighboring Laos have diminished over time. Isaan provides many of the capital’s construction workers, taxi drivers, waitresses and other service sector staff, but they are viewed by many Bangkok residents as second-class citizens, poorer and less educated. These condescending attitudes are reflected in the mass media, where, “Isaan people are relegated to the sphere of comedy, slapstick, and farce, the traditional sphere of servants,” noted Cornell University’s Professor Benedict Anderson. Yet these outdated, offensive views are themselves the product of ignorance among a smug and insular Bangkok middle class that is fearful for its future. Isaan has seen impressive economic growth, and educational levels have shot up in recent years. Several studies have refuted the allegations of vote-buying that are commonly used to justify claims the government is illegitimate. “The upcountry electorate is richer, better educated, and more experienced at elections than ever before,” said Chris Baker, a British analyst, who — with his wife — has written a biography of Thaksin. The coming days and weeks are crucial to determining the future of Thailand. 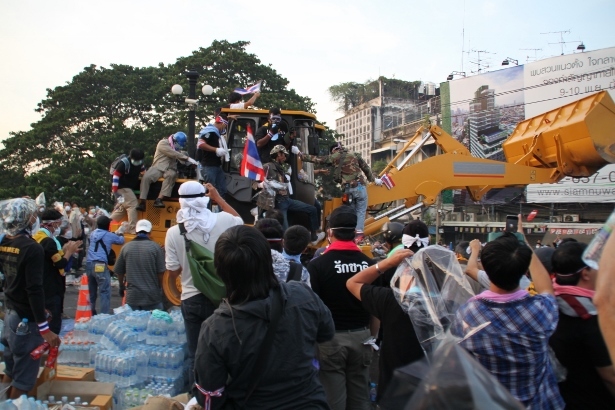 Suthep has vowed to “seize Bangkok,” urging his supporters to shut down the city on Jan. 13. He has told television stations to broadcast live announcements by the protest leaders, and threatened to cut electricity and water to government offices and the homes of ministers. The protest leaders appear to welcome the prospect of more violence and instability, believing this would provide a pretext for the military to step in and stage a coup. On Dec. 27, Army chief Prayuth Chan-ocha refused to rule out that possibility, to the dismay of the government’s supporters. Yingluck has spent the past couple of years assiduously courting the army that overthrew her brother, but appears to have lost its confidence. The military is a key power broker in a country that has seen 18 coups or attempted coups since the end of absolute monarchy in 1932. But it is also divided, with many “watermelon” troops — green on the outside, red on the inside — in the ranks. Analysts say some senior commanders may also side with the government in the event of an attempted coup. Other possibilities are that the country’s election commissioners — in charge of organizing the Feb. 2 polls — will step down, or that the courts will bring down the government in what would amount to a judicial coup. Thailand’s anti-corruption agency will soon decide whether to file charges against Pheu Thai MPs who proposed amendments to the military-approved 2007 constitution. And with protesters still blocking candidate registration in some southern provinces, it is uncertain whether a government could be formed even if the election takes places. The government and its supporters have so far acted with commendable restraint, even allowing the protesters to occupy key buildings in a bid to avoid confrontation. But anger is growing daily in red-shirt communities. They remember well the events of May 2010, when then-premier Abhisit Vejjajiva and his deputy Suthep allegedly authorized troops to use live fire to clear red-shirt protesters occupying central Bangkok. More than 80 civilians died and around 2,000 were injured in the violence that followed. Many angrily compare the actions of the army then with its conciliatory approach to the current crop of middle-class protesters. “They are very angry,” said Jaran Ditapichai, a red shirt leader and parliamentary candidate for the Pheu Thai party. He noted that many are talking openly about the possibility of the northern and northeastern provinces seceding from Bangkok — a move he believes would be impossible. Jaran stressed that he was hoping for a peaceful solution, and said red shirts in the provinces are rallying with the slogan “yes to the general election, no to civil war.” But in the event of a military coup, he said, the red shirts would “stand up and fight” to defend the government. Other red shirt leaders have vowed to mobilize supporters to “keep Bangkok open” during Suthep’s promised siege. Whatever happens next, Thailand’s political turmoil looks set to continue for some time, and the elites that have wielded power for so long are unlikely to give it up without a fight. This article has been written in a political and legal climate that has a deleterious effect on freedom of the press and obliges journalists to practice self-censorship. Well written piece with lots of good and balanced analysis. My only problem with it was the over reliance on Marshall’s contribution at the end. This is a guy that wanted to imperil many hardworking Thailand based foreign journalists to stand up to the lese majeste laws, thereby risking imprisonment, while he was safely ensconced in Singapore. Hardly “practice what I preach” behaviour. It would have been interesting to hear your views on how it will end instead of that big mouth in Singapore who’s no better than the man he attacks – Thaksin who also hides, but in the warmer climes of Dubai. Thank you for sharing your views Tom. I’m intrigued to hear that I’m “no better” than Thaksin Shinawatra. I hadn’t realised my baleful influence on Thailand was so significant. I’ve never suggested that journalists working in Thailand should get themselves thrown in jail. I have argued instead that those who choose to report from within the country should add a disclaimer to their work noting the repressive conditions under which they have to operate. This way they can report with honesty and integrity while still keeping within Thai law. Coincidentally, this article includes just such a disclaimer, noting that it “has been written in a political and legal climate that has a deleterious effect on freedom of the press and obliges journalists to practice self-censorship”. That is exactly what is needed, and I applaud Mark Fenn and Waging NonViolence for appending it. I hope more journalists start to follow this excellent example. Best wishes. You’re welcome. Nice to see that you’ve stuck to the issue at hand this time as opposed to arguments ad hominem and calling me a “drunken oaf” for giving an honest opinion. I sense a degree of maturity. The Singapore air must be agreeing with you. Hope it lasts. I’m based in Phnom Penh these days, Tom. Incidentally, I was slightly bewildered to be criticised by you as somebody who “attacks” Thaksin because previously you have often criticized me for allegedly defending him. Did you intend to say that or did you just use the wrong word by mistake? Nope, you’ve attacked all the players in the Thai political drama at various times (as have I) so that wasn’t a mistake at all. It would be strange if you hadn’t while still hoping to retain the idea of ‘balanced’ coverage. The larger point I was making of course was about people saying or doing one thing and then, after getting their knuckles rapped, running off to safety. That is something you share with Mr T. It could be the only thing of course. You should look up Chris Taylor – he’s just set up shop in PP, too. I’m glad you’ve acknowledged that your previous position accusing me of being an apologist for Thaksin Shinawatra was wrong, Tom. Many thanks. However, I don’t agree with you that balanced coverage is about attacking all sides equally or giving equal prominence to the claims of all sides. In my view, balanced coverage is about rigorously seeking the truth and following it wherever it leads. You’re characterization of me “running off to safety” after having my “knuckles rapped” is rather inaccurate. What happened was that while based in Singapore in a senior job at Reuters I gained access to thousands of leaked U.S. documents which I believe contained valuable insights that add to our understanding of contemporary Thailand. I felt the most useful thing I could do was write a detailed analysis of the cables and share it online along with all the raw documents. Because this entailed breaking the lese majeste law, which Reuters was unwilling to authorise, I resigned from my job in order to share the material. I also no longer travel to Thailand, despite the fact I love the country and have a Thai family, because I don’t want to face the prospect of being put on trial and jailed under a law that I consider unjust. If you feel what I did was somehow cowardly or dishonest, you are entitled to your opinion, but I’m interested to know what you think I should have done instead. Should I fly to Thailand and hand myself over to the authorities so I can be jailed for sharing the cables? Or should I just have censored myself and not shared the cables in the first place and kept my lucrative Reuters job? Finally, I’m intrigued to learn that you have “attacked all the players in the Thai political drama at various times”, and I confess I must have missed your analysis of Thailand’s 21st century crisis. Can you let me know where I can find it, please, and particularly where I can read your frank appraisal of the monarchy’s role in the political conflict. I’d be genuinely interested to read it, and if it is substantive, to cite it in my upcoming book. Best wishes. Hmm…I was of a mind to not clash with you today as I’m busy, but you obviously want to continue with your provocative statements, so here we are again. How on earth are you going to get at the truth if you are not asking difficult questions from both sides? Or are you suggesting you sit with them, sip Earl Grey tea, and compliment them on their policies? Getting at or “seeking the truth” is a misnomer anyway as the truth is rarely if ever that simple. To a Red Shirt, it’s seen in centuries of being put down, lampooned and cast as the stupid farmer in the nation’s drama as well as being denied the real fruits of the country’s labour and denied a decent education or healthcare. To a city-dwelling Thai from say, Bangkok, it’s seen when a political and populist demagogue comes to steal from the country’s coffers like a master burglar come to steal the family jewels and, at the same time, installing his cronies and family into the highest positions in the political sphere. Truth is always the first casualty and whichever way to go about getting at it or “seeking” it, you will only ever see one side – never the complete picture. Your portrayal of truth reminds me of the criticism often leveled at the Red Shirts: that they have been conditioned to believe there is only one truth and are unable to see the rainbow elements that underpin it in Thailand. I hope you really do not believe that and are just waxing lyrical, but I suspect you really do believe there is one truth and that one of these sides in the Thai conflict is really the “just” or the “true” one like a medieval drama. The natural question, therefore, should be: which one, and who should be the judge? There you go again. More befuddlement. Please remind me where I said I had provided a “frank appraisal of the monarchy’s role in the political conflict”? If you had read anything I have written, (and I do sometimes wonder, and to what depth? ), I have made it clear that I do not support foreign journalists criticizing the politics, royalist or otherwise, of another country. This for me is part of the problem, not the solution. Until Thais are able to decide their own fate and their own political systems by themselves, with no outside influence, there will never be peace, certainly not long-lasting peace. This is surely what it means to achieve political maturity. As I said above, I have criticized others in the Thai political arena. But this isn’t about me, is it? I am not the one chucking the kitchen sink at fellow journalists; people in the same line of work, am I? So, much as you would like to paint me as the villain here, you will have to try a little harder. I’m done now. I have a writing deadline where I am actually paid to produce words. I have nothing further to add to this conversation where you are concerned. Nice to see that you used your first post to pull the discussion away from the issue at hand and onto one of the sources and then to make an ad hominem attack by calling him a ‘big mouth’! You’re hardly a paragon of ‘practice what I preach’ behaviour yourself now, are you? Sigh, another bold attempt to explain the complex crisis using the same old cliches, demographic generalisations and selective quotes. Most the article follows the historic facts from one perspective or another but neglects the conclusion that: however many times you win an election you cannot run a country on remote control from Dubai for your own obvious benefit. Democracy in Thailand is broken, money skews things horribly, and the outcome of any elections usually ends up with half a million people on the streets. Call them sore losers, but it’s a lot of people and they are demanding reform before anything else. Reform is not ‘less democracy’. Sigh… yet another “Thaksin is BAD!! !” shout into the void to explain away and rationalize all… “reform” performed by “good people” chosen by “big people” who claim to represent “the people”(in spite of failing to get elected for a couple decades) is not so much “reform” as anti-democratic “reaction”… shame, shame, shame on you Andrew! It’s a lot of people but it’s not as many as voted for Yingluck. Did you benefit from the Great Palm Oil swindle managed by Kamnan Suthep or do you do this extreme-right agit-prop for free? Well written and pretty accurate in my opinion. It amazes me how people think Thaksin is THE issue. He was not around for the first 17 coups/attempted coups, so we can safely assume the problem is deeper than Thaksin – as this piece so eloquently explains. Thaksin (as bad as he may be) is only the flavour/excuse of the day. To clarify – I mean the piece is well written – not Andrew’s comment. First suggesting “reform” is not less democracy…it is for less democracy when the word “reform” is being used as a propaganda cliche. The only thing the democrats, Suthep, PAD and other right-wingers want is to rig the democratic process so they need not begin taking into consideration those “ugly, dangerous, uneducated” dark-skinned people that work as modern day serfs. Maybe the worst is who would play the maids, tricksters, hustlers, drug dealers, gardeners and other low life roles in the daily sitcoms? Who would feign fainting into the rich husband’s arms to make the beautiful, benevolent and sincere white-skinned, iPhone toting wife think they were having an affair? Second, democracy in Thailand is not broken but, rather, has been dismantled/broken again, and again, and again…ad nauseum…by those powers behind the scenes who do not want democracy. Sort of like breaking a child’s legs every year or two just to make sure it cannot learn to walk properly and then saying “see, he cannot walk properly”; waiting until the child starts walking again and of course…breaking its legs when it does. Basically this repeats the cycle of many decades of right wing interventions. BTW I am hardly fond of Thaksin and IMO the PTP has betrayed its voters more than once and is lucky to still have so much support from the red shirts. But that support is (more consciously than you might want to accept) more out of a determination to refuse to let democracy be dismantled yet again and far less than before love of Thaksin. If it makes you any happier I firmly believe PTP will be brought down soon. With the NACC already having done its pre-programmed part in defining the actions of MPs carrying out their duty in proposing constitutional amendment as potential grounds for impeachment; Prayuth stating any violence will be squarely laid at the feet of the current government, and; Suthep and Abhisit determined to avoid having to stand trial for murder…the stacked deck of cards being played out is just to avoid being too transparent about what is, essentially a coup. If this government is brought down, Suthep and AV will point the finger at its illegitimacy and therefore conclude, the charges of murder against them were politically motivated and consequently also illegitimate. Some speak about Thaksin’s hiding out from justice (convicted by a kangaroo court under the thumb of the military-appointed government) yet ignore the extremes to which these two men are going to avoid accountability. I’m sorry to be so befuddled, but I confess I am struggling to make head or tail of your ranting. You claimed that you — like me — had “attacked all the players in the Thai political drama at various times”. Since it is clear to any credible analyst that the monarchy is a player in the drama, I politely asked where I might find your critical writings on the role of the palace. You responded by denying that you had ever said such a thing, adding: “If you had read anything I have written, (and I do sometimes wonder, and to what depth? ), I have made it clear that I do not support foreign journalists criticizing the politics, royalist or otherwise, of another country.” Which I assume means that we can only do sensible critical journalism on our country of birth, and should avoid any negative comment about Mugabe, Assad, Hun Sen, Putin etc etc. I was slightly confused because if I remember rightly, you are a vitriolic critic of Thaksin Shinawatra and he comes from another country. My confusion deepened when you then said in the very next paragraph: “I said above, I have criticized others in the Thai political arena”. In fact, you had just denied having done so and vehemently insisted you do not support such behaviour. Finally, you condemned me for “chucking the kitchen sink at fellow journalists; people in the same line of work”. But you’re the one who started our discussion by denouncing me as “that big mouth in Singapore who’s no better than the man he attacks” and claiming that Mark’s article was marred by including my comments. Interestingly, you made no suggestion at any point in this discussion that my comments in the article were wrong, or to engage with them constructively. You just objected to be being quoted at all because you don’t like me and think I am a bad person — as bad as Thaksin, in fact. Which rather undermines your point that it is important to listen to all sides. Finally, if you think I have a simplistic goodies-versus-baddies view of Thai politics, you obviously haven’t read my latest major article ‘กลียุค’. Google it. You might just learn something. And if you think it’s rubbish, I’d welcome constructive criticism of it, which would be far more useful than tedious ad hominem attacks. I was criticized in very personal terms and I chose to respond to set the record straight, Bakoff. That’s not trolling and I did not use hateful language. However, speaking of trolling, it has come to my attention that you are posting comments here under at least four different aliases — Bakoff, Jing Jing, Longuahah, and Moimoi — and bizarrely, having fake conversations with yourself. So I wouldn’t give much to what you say either, however many fake names you use. Best wishes. is that a statement you can prove? Whoever wrote this article doesn’t understand Thai Culture… He’s calling anti-Ginluck protesters Fashists… One could argue simply that an ousted leader’s sister should never be allowed to get into power and that if they do it’s via a process of manipulation and deceipt… The author of this arcticle is a Xenophobe, towing the line of red-shirt propaganda… (and getting paid to do it)…. You should remove this authors comments because they incite hatred and he’s backing the wrong horse with his biased right wing sweeping generalisations.. The issues raised are valid but the North East people are now vulnerable to break away from Thailand- sounds crazy but not so. Growth in all sectors has created a form of urbanisation which has the clear potential to out grow Bangkok. Please refer to Bangkok Post Economic Review mid-year 2013. Now with regards to Suthep he will not or rather has shown no intention to attend court and face the murder charges. Abhisit has been to court and pleaded not guilty. Thus it leaves one with the thought that there is a split in the Democratic Party on how to face this dilemma. Could it well be that Suthep ordered the Army to use live ammunition and Abhisit did not deliver that order? The progression, full of reverting as it may be, of the political travails there seems fraught with trading postures, sharing tactics, mutual alternate co-opting of rhetoric, and consistent reliance on a framing du jour, popular amnesia, appeals to vilification and fickle espoused loyalties. The method in all that is uniquely Thai, as will need to be its remedies, I believe. Until the nation outgrows its outmoded strategies, which proved of some value in former contexts, but are categorically inappropriate to a pluralistic modernity, the symptoms of a peoples allergic to themselves will continue to manifest. Ure a but of a thug with a pen. The bloke answered ur questions line by line but ur still nit accepting a word. Give over will u! He’s right. U r a big mouth! Good article but its a bit one sided. Regarding “democracy” dont forget the government tried to change the constitution to suit their ends. Also i dont believe its a “class war”, elite vs aristocracy. Certainly Thailand is a period of natural development when the new money classes are taking power from the old. And so they should.